The Santa Fe Railway Company's high-speed Super C intermodal freight train prepares to leave the Corwith Yards in Chicago on its maiden run, January 16, 1968. The Super C was a premium, high-speed intermodal freight train operated by the Atchison, Topeka and Santa Fe Railway from 1968 to 1976. Dubbed the "World's Fastest Freight Train," the all-TOFC (trailer-on-flatcar, or "piggyback") and container train's route ran the 2,200-mile (3,540 kilometer) route from Chicago, Illinois to Los Angeles, California on a 40-hour schedule. 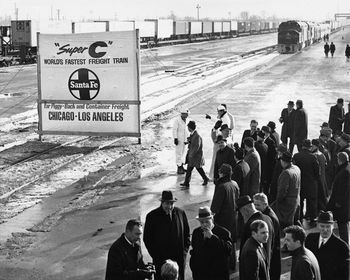 The "World's Fastest Train" prepares to leave Chicago on January 16, 1968 with a number of Santa Fe trailers loaded on flatcars. © Photo: Orville Brent, Jr.
Truck trailers from the Atchison, Topeka and Santa Fe Railway are being loaded on to flat cars for piggyback service at Hobart Yards in Los Angeles, California. The dual flat cars have the ability to handle either containers or trailers, or a combination of both. In 1952 the Santa Fe first experimented with the TOFC concept using perishable food containers chilled with dry ice. Two years later the company officially inaugurated piggyback freight service between Chicago, the West Coast, and the Gulf states. For years, standard practice for the loading of vehicles on flatcars involved the placement of a ramp at one end of the train with special bridge plates used to span the gaps between cars; standard highway semi-trailers would then be driven the length of the train along the decks of the flatcars, procedure known as "Circus Style" loading. 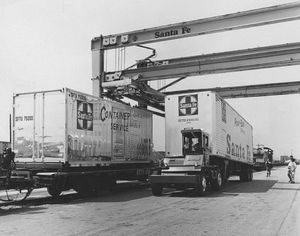 In order to better facilitate loading and unloading, in 1963 Santa Fe developed the first successful overhead top-lift crane system capable of handling piggyback trailers. Santa Fe's first foray into high-speed freight operations on its Illinois Division took place in late 1966 when, on October 9 they test ran a high-speed consist composed of 31 New York Central System "Flexi-Van" containers; three days later the test was repeated utilizing 29 standard piggyback trailers. By year's end, a set of passenger-geared GE U28CG locomotives was able to transport 19 piggyback cars from L.A.'s Hobart Yard to Chicago in 61 hours. On June 8, 1967 a joint run using 18 New York Central container cars traveled from New York City to Los Angeles in 54 hours and 20 minutes. The brainchild of company president John S. Reed, the Super C (led by a pair of EMD FP45s) made its inaugural run with 7 two-trailer AT&SF flatcars on January 17, 1968, covering the distance in a record-breaking 34½ hours and averaging 63.7 mph (108.4 km/h) in the process. For an added fee of $1,400 per trailer shippers received guaranteed fast delivery and six-days-a-week service. The train's cargo typically consisted of such high-priority items such as auto parts and electronic components; the United States Post Office was a consistent customer. Topping out at 79 mph (or 127 km/h, equal to the Super Chief) the trains were operated as "hotshots" (no classification, and no pick-up or drop-off). 17 crew changes were required en route. 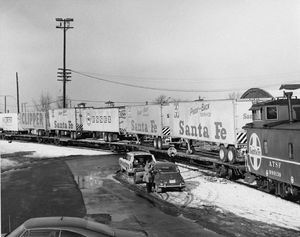 Though the size of the Super C's consist on a day-to-day basis varied from as little as two to as many as 15 or 20 cars, it always generated positive public relations for the railroad as it tangibly demonstrated the Santa Fe's ability to provided expedited freight service over its modern rail system. Around the same time, the competing Northern Pacific Railway fielded a similar fast freight service on the 1,875-mile (3,018 kilometer) Seattle-Minneapolis "Tokyo Express" line, which averaged 51 mph (82 km/h), and cost less than the Super C. In the end, however, too few shippers opted to pay the premium for 40-hour delivery, especially when considering that a standard TOFC load arrived in just 15 hours more. The final blow came in 1976 when the Santa Fe lost its USPS contract to a joint venture of the Chicago and North Western Railway and the Union Pacific Railroad, who could deliver the mail at a lower rate, albeit more slowly. The express freight concluded its last cross-country trip on May 20, 1976. This page was last modified 20:29, 31 August 2013.